Lord Meghnad Desai delivered the first Dr.A.M.Shaikh Memorial Lecture at Belgaum Institute of Management Studies [MBA] at Abu Campus. The world has witnessed a peculiar kind of recession in the recent past. This is different from the depression of the 1920s. In the past recession was due to people not spending enough. In the recent past the recession happened due to the so called financial innovation and high dependence on borrowed capital and over spending from borrowed funds. This peculiar situation has brought about a complete change in the state of world economy. He said “the economic world has turned upside down” the west is debt ridden and becoming more and more intolerant and becoming a recluse. This will infact harm the western and the developed countries. Now he said is the time for countries like India, Brazil, China, Russia and South Africa to lead the resurgence in the world economy. 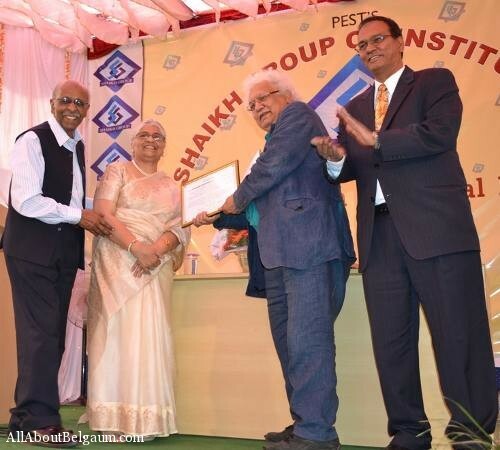 Lord Meghnad Desai being felicitated by Dr.Abu Shaikh, Managing Trustee, Shaikh Group of Institutions, Mrs.Atiya Shaikh, Trustee, Shaikh Group of Institutions and Mr.Aftab Patel, Chief Executive, Al-Omania Financial Services. He said the economic cycle is very simple, All booms come to an end and so do all slumps. The reality that emerging countries have a role to play in world economies is proved by the fact that the erstwhile G-7 group has now expanded to G-20 paving way for the developing countries have their say in the affairs of the world economy. No country can get out of recession on its own without the help or cooperation of other countries because of the interconnectivity of economies among the countries. Emigrants do not bring recession or job losses. They bring in competitive labour which would really make production efficient. But, since the western world has a well developed social security network there seems no incentive for risk taking and hard work. These precisely are the virtues that the emigrants process. The event was witnessed by Belgaumites, which included students, faculty members, principals, and business class people. This event also witnessed Video Conferencing to Alanna Institute of Management Sciences, Pune and was viewed by many students and faculty members from Pune. thank you for posting the event.on AAB our one stop shop for all happenings about belgaum. Well done BIMS ! Great event. Thoughtful speech. More such events needed at Belgaum. Does anyone have a transcript of his speech. If so post. Lord Meghnad Desai has been caught in a controversy over alleged plagiarisation of a PhD thesis by Colonel Muammar, Libyan leader Gaddafi’s son. The London School of Economics on Tuesday ordered an investigation into it. a great event and real informational..